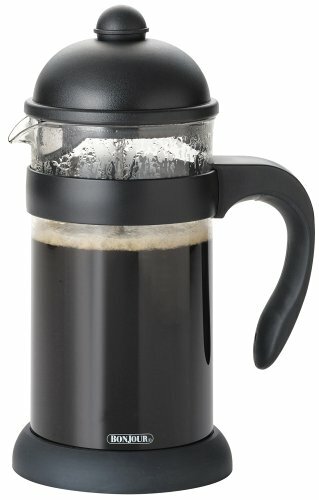 A virtually unbreakable polycarbonate carafe makes this coffee press sturdy enough for picnics, camping, or dorm use. To use a French press, grounds are placed in the bottom of the (preheated with hot water, if possible) carafe, then near-boiling water added. The lid with its stainless-steel rod and filter is pushed down after a few minutes of steeping, and the coffee is ready to pour. Many coffee aficionados swear by the French press method. The Hugo features a second mesh screen in the lid that removes even more of the coffee grounds sediment typically left behind by most coffee presses. Much like everyone else has said this does not look like three cups. Actually, if you hold on one second I will test this out; Okay, I filled a measuring cup with 2 cups of water, and to full capacity this thing didn't even hold the full two cups. Now, this is an outrage to me. Because a) it doesn't even fill two cups when it boasts that it will hold 3 and b) even if with the almost-two cups it can hold, it certainly won't make two cups of coffee in one shot. If you subtract the space occupied by the grounds, and the press element of the coffee press, it'll probably make one whole cup of coffee. Rip-off man. Unbreakable, good. Everything else, Bad. I've been using this press for a year now and I just can't use it any more. My background: Coffee fanatic. I've spent a long time perfecting the grind and tamp for 12bar pump espresso and a fair amount of time perfecting my regular coffee technics. I like coffee. Problem 1: the screen might be a little too fine. The idea of a press is to use coarsely ground coffee. With a burr grinder (the best I can afford, anyway) you end up with a small amount of grounds that are too fine and clog the screen. Then, as you try to push the plunger down, the grounds sneak out around the rubber gasket that seals against the walls of the plastic cylinder so not only do you have problems pressing the grounds, but you can't drink the last few sips from the bottom of the cup unless you like gritty coffee. Problem 2: Once you do get the grounds filtered, you go to pour the coffee and the lid creates a vacuum so the coffee just dribbles out. So you have to pry up the back side of the lid a little with your thumb to allow replacement air in. Along with that, the secondary screen - which is a good idea in theory - immediately clogs. Then, once you do manage to finish the pour and you set the press back on the counter, you end up with an ounce of coffee back in press. Sort of a mystery until you realize that the ounce is being held in the domed lid as you try to pour it and never makes it out of the spout. So then you have to pull the cap off far enough so that the coffee can pour out and not get caught in the lid. I thought maybe this was a feature to help keep the fine grinds from making it into my cup so I tried leaving that ounce in the press (which is about 10% of the coffee in this small press). The bottom of my cup was still covered in coffee mud. This was the first "french press" I ever bought. The 3 cup size is measured by the European tiny 4oz per cup size, so it should make about 12 oz, though with the beans taking up room, it holds between 10oz-11oz. It makes the perfect (for me anyway) size cup for one. I was never a big coffee drinker, and when I did drink it, I always loaded up on cream and sugar. This press makes such wonderful coffee, and it's never bitter, I drink it black and love it. In case you are assuming that since I'm not a huge coffee drinker that I like it weak and light, I much prefer the coffee to be dark and full bodied. I'm mainly drinking one "cup" a day for the antioxidants and other health benefits you get from drinking freshly ground coffee, and by using a french press, there is no paper filter to absorb most of the beneficial and flavorful oils. I use two measuring tablespoons of coarsely ground beans for each pot, pour almost boiling water over them, stir and let brew for a few minutes, then slowly depress the plunger to push the ground to the bottom and pour. I buy my coffee locally from a small company that roasts their own beans, but I think any coffee would work fine as long as it is coarsely ground so you don't get small gritty pieces escaping through the filter into your cup. I get the beans whole and freshly grind them myself with the Krups Fast Touch Coffee Grinder. The housing for the metal mesh filter is made out of thin cheapo plastic. Over a very short period of time, from normal pressure of pushing it down on the coffee grounds it breaks apart rendering it useless. I bought mine several years ago from a local company and it was the only small one they had. I wrote this review because I see from the current reviews that they are still making this model with the same lousy plastic filter housing. When mine broke, I found one on Amazon that was identical but made of glass (which I prefer anyway), and most importantly the filter housing is made of stainless steel making a very durable product (it also doesn't have a silicone seal, its just metal mesh). Unfortunately Amazon is not currently carrying it, but I've heard that the Bodum brand has the all stainless steel housing in theirs. Bottom Line: If you can find the one with the stainless steel filter housing grab it. If you want the unbreakable carafe (this one) be very careful not to exert much pressure on the plunger or the plastic will break. The BonJour Hugo 3-cup is a total of 12oz's it is not a conventional 3cup times 8 oz's. It will barely squeeze out a single 8oz cup of coffee. I was not happy when it arrived and contacted the company to suggest they update their ad to say the press produces 3,four ounce cups and not mislead the public by labeling it 3-cup. (Buyer beware. )I did decide to keep it as it makes a great single cup of loose leaf tea. I bought one of these thinking the plastic would be better for work. The unit lasted only two months before the rubber seal and plastic seat disentigrated. The plastic handle / holding band slip when the beaker is hot. Then we, Americans are the onlypeople on earth to measure a cup as 8 ounces. Even our US china makers make drinking cups in the 3 to 4 ouncesrange. in reality a 3 cup(read 3 tasses) will produce one 11-12 ounce coffee mug. Re the non metalic plunging 'filter: plunge slowly with a pristine clean mesh.If resistance becomes strong, back up an inch and plunge anew. in extremecases(usuallythe resultof the "fines', the powder produced by poor grinders) remove the plunger, rinse, restart the plunging(slowly! )I soak my plunger in hotwater immediately fter making my coffee, never had a problem but again,I'm not ham-fisted and Idon't mind taking a full 30seconds to plunge the water/coffee mix. It worked great ..... until it broke. I've use it for less than a year. the press part of the french press broke. there is no way to replace it. WHY DO THEY CALL IT a 3 CUP PRESS..I barely get ONE cup out of it!! Are they talking EXPRESSO cups? Well anyway, every single time I use it I get grounds in my cup! EVERYTIME! GROUNDS!!!! yuck! You can see it's cheap junk when you open the package. The cheap plunger just fell apart after a few months of occasional use. Very disappointed. The Bonjour website and customer service is similar to their craftsmanship. First I liked this press - good coffee, reasonable price. I bought this back in 2007 and was initially happy with it. Turns out "unbreakable" only refers to the cup, not the rest of the press. After a month or so the plunger screen broke in half. The coffee maker is brilliant, it's better than the normal bodum glass press as it has a rubber surrounding to the shaft filter, so no coffee will run through the holes. It's great as it doesn't break. It has an embedded coaster which is an addition i like. I've had mine for about a month and the ring around the screen on the plunger has already come off and doesn't appear to want to go back on. In general, I think the screen/plunger piece does not fit well and lets a lot of air (and grounds!) pass through the ring, no matter how slowly or carefully you press down the plunger. This may be okay for camping trips since the carafe seems very durable, but I do not recommend this for daily home or office use. In fact, this weekend I'll be shopping for a larger and less cheaply built glass coffee press in a brick-and-mortar store. Is it really a 3-cup? I bought this french press about 5 months ago. For the first four months, I only used it on weekends. For the last month, I used it almost every day, until it started to fall apart and finally broke today. About a week into my using the press everyday, I realized that a lot of the grounds were getting into my mug, despite the double-filter system. I couldn't quite figure it out and just gave up on the last sip of coffee. Then a week later, the rubber ring around the mesh filter fell off while I was rinsing out the press. Merely rinsing! I didn't even get to the gentle sponging that I usually apply. Needless to say, from that point on, I was even more gentle with it. I was able to tuck the rubber ring back around the plastic, it looked fine, but the grinds really started to seep through. Today, when I was pulling out the filter to dump out the grinds, only the top portion came out. The plastic ring holding the mesh filter together was stuck to the bottom of the press and the plastic ring had crumpled into several pieces. I got this little French Press for Christmas (cost was the full $25) and used it every day for five months, until the plastic screen holder on the bottom of the plunger pretty much disintigrated. I've used french presses for years and am in the habit of disassembling the plunger/filter mechanism for periodic cleaning. This is fine for metal screen holders, but this plastic one cracked and soon broke into small pieces. Well, I bought it, and originally gave it a 4 star review. But I've had it less than 5 months, gently used, and like many others - the screen broke. I really like the design of this, and the fact that it is only good for one (not 3) normal coffee mug is perfect for me. But to market an item as unbreakable, when obviously at least one part of this item is very breakable - just read the reviews. That's just not true. I used the BonJour 3 cup Unbreakable French Press for about a semester. Then, I forgot to clean out the coffee grounds and left them in the mesh for about a week. I tried to clean out the moldy mess that was left, but it was incredibly difficult to get everything out of the mesh. Unbreakable, unless you intend to make coffee. I won't start by complaining about the size, it does say twelve ounces. It also says "Microwavable when lid and metal parts removed." So I used this to boil water in the microwave and the bottom cracked after four uses.